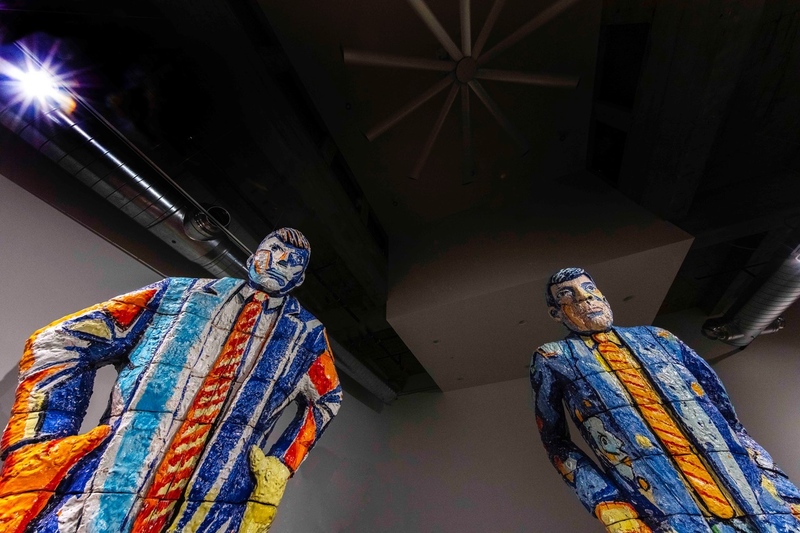 The Kaneko’s Winter/Spring 2019 exhibition season opened in January withHuman Condition,another multi-media opus that will play on until May 4 at the south edge of the Old Market. Like its previous seasonal offerings that cast a wide net, the new season consists of an encompassing theme, group art exhibit, several associated events such as musical and multidisciplinary recitals and educational programs and workshops. The main attraction is the group show, featuring works by seven artists; Sunkoo Yuh, Viola Frey, John Buck, Ken Little, Misha Gordin, Jim Krantz, and David Helm. Patrons should not expect to see direct references or abstractions of Hannah Arendt’s celebrated book or Kobayashi’s epic film, however. 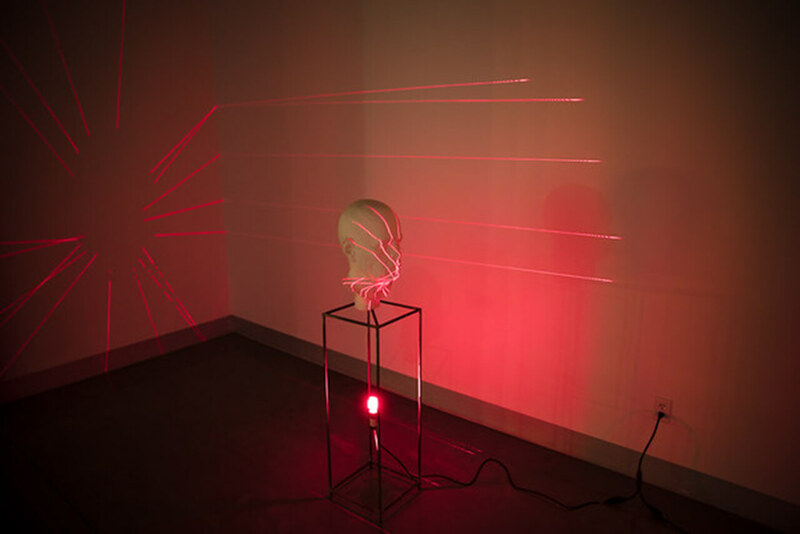 The exhibit features seven disparate artists, primarily working in sculpture and photography, that individually provide a sampling of their works, and as a group connect to the theme. The works are noticeably linked through personal or cultural narrative and the dominant use of the figure. The featured artist in the Bow Truss Gallery is Sunkoo Yuh. An artist and educator originally from Korea, Sunkoo is an art professor at the University of Georgia. 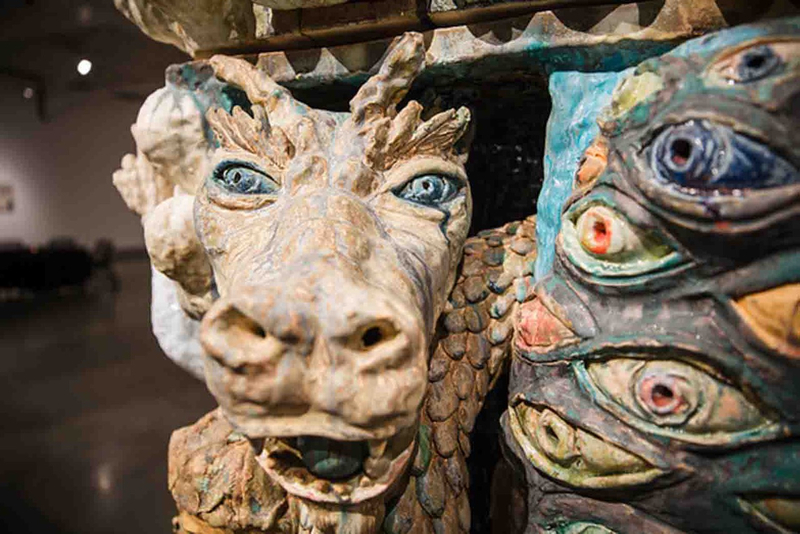 His signature work is massive, ceramic sculptural assemblages, exciting piles of storybook animals, faces and figures, mythological creatures, tribal deities, dragons, all intertwined with occasional flowers or plants. This is Sunkoo’s second outing at Kaneko, the first being the 2016 Passion and Obsession exhibit. The imagery is childlike but haunting, mostly due to his loose, drippy glazes and rough application of the clay. These heavy (several weigh 3,000 pounds) stoneware totems are jumbles of shape and layered color, a mix of the surreal and the pedestrian, the mythical with the real. Be sure to walk around these towering pieces, as surprises await on all sides. On the walls of the Bowtruss gallery hang several large, six-paneled ceramic “murals” populated with figures that Sunkoo renders in caricature. Influential figures, from the artist’s life and imagination, mythological and spiritual, friends and family, all standing or sitting on a flattened landscape, the shallow perspective an homage to early folk painting styles of Southeast Asia. Several of the murals are done in the traditional and very recognizable style of under-glaze blue-on-white. You may notice in Sunkoo’s spontaneous drawing style a touch of German expressionism and even a dose of Matt Groening. Of note is the “Kohler” mural (2014), a matte black, porcelain slip casting hanging on the west wall, and its mate in brilliant cobalt blue directly across on the East wall. Not to be missed, around the back walls of this hanger-like space, are several ink drawings on paper, expressive monochrome sketches that although contemporary harken back to the calligraphic traditions of some Asian cultures. Although Sunkoo’s work wins the “heaviest art” prize, he is challenged by Viola Frey on the second floor. (Apparently there were plans to show Sunkoo on the second floor, but the pieces were deemed too heavy.) Frey’s towering ceramic figures, three men in suits, have material similarities to Sunkoo’s totems, with regard to handling of the clay and the loose techniques in glazing. There is also here a kinship with the stylings of German Expressionists of the 1920s and 1930s. Three clownish caricatures of “businessmen,” domineering, hovering, annoying, leering. Extra-long compensating ties, coiffed hair, large hands, these harlequins appear to be ready to reprimand or correct. They are glazed in basic colors; primary blues, yellows, oranges and reds, rendered with only minor detail, but with their body language it is enough to assume an intimidating expression of condescension. Frey was an artist and educator, and aside from her prolific reputation, is widely known for her colorful, large ceramic figures that she started around 1980. She is considered to be one of the premier artists in bringing clay work from the craft world into the world of fine art. Though Frey died in 2004, the three figures, cast in 1988 and ’89, could represent anything from 1950 to 2019. With today’s culture of gender inquiry and controversial razor commercials, her work is as timely as ever. In the same display space on the second floor you will find a kinetic sculpture by John Buck, and an offering by sculptor Ken Little. Buck, you may remember, was featured artist at Kaneko’s Kinetic show last year. His entry into this show is an ultra-timely, kinetic sculpture “March of Folly” depicting current political events ala North Korea, Trump, Putin, et al. Bringing up the rear is a missile with Kim Jong-un hanging off the side. A little transparent, political side-taking, but the artist is known for his interpretations of current events. “March of Folly” is as fun and intricate as anything in his previous outing, from his Jelutong sculpting to his mechanical and aesthetic connections. His depictions of the main players are humorous and spot on. 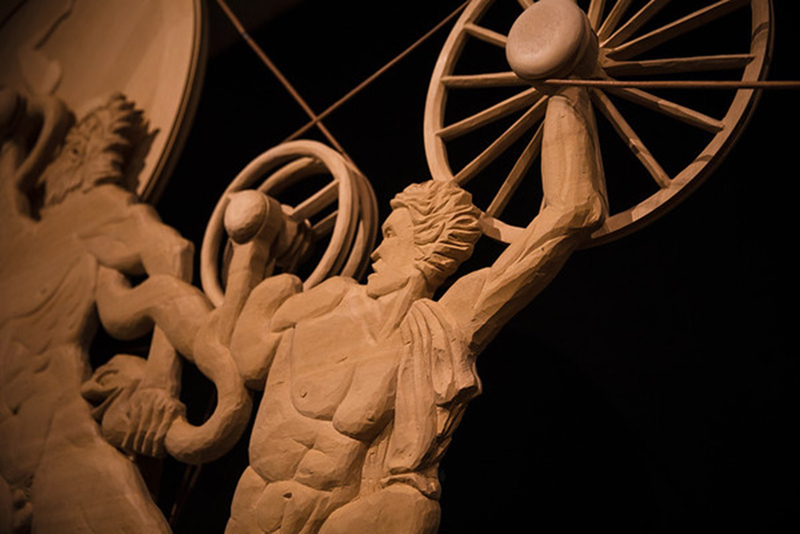 Sculptor Ken Little is a musician, conceptual sculptor and installation artist, working and living in San Antonio. His pieces offered here are a series of three larger-than-life, figurative assemblages. 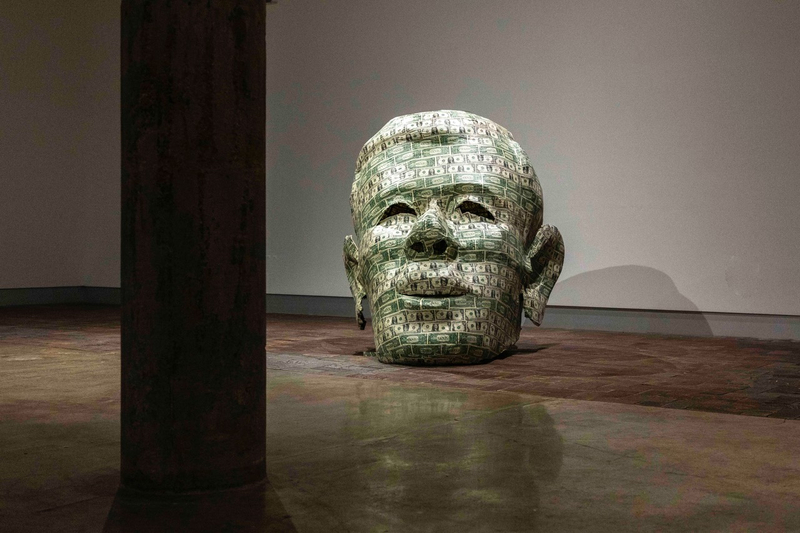 Each is made from a steel armature shrouded in a steel mesh covered with (a lot of) real one-dollar bills, forming the shapes; an oversized suit, pair of pants, and a head. They are simple and devoid of much detail. Once you get past trying to add up the value of the bills, you come to realize the revealing negative space, the vacancy within each piece. While we are on the second floor, the last entry is photographer Misha Gordin. The work in this show, from his Scream series of 1984-87, is probably his most recognizable. Disembodied heads, many apparently straining to leave the frame, some appearing complacent and resolute. Several of the heads have stamped numbers on their foreheads, some are bound with string or tape, others caked with dried mud. They are all, apparently, alive. The stuff of dreams and nightmares; as masterfully done and as appropriate to the theme as anything in the show. Any local art patron of median age, however, will have seen these images at some point. Gordin and the Scream series seem to be local and perennial favorites. That aside, this is masterful conceptual photography, and all analog, for those who are interested. Back to the first floor, where celebrated photographer and videographer Jim Krantz is represented in the west gallery with his documentary “Homage: Remembering Chernobyl” (2011). Comprised of about 28 color prints, the work depicts people, animals, buildings and even vegetation in the 38-mile wide Exclusion and Alienation zone around the Chernobyl nuclear disaster site. The tragedy occurred in 1986. The photos show poignant scenes of people working and living, a threadbare society, at first portraying a slight sense of normalcy, with brightly painted buildings, bright grasses and resilient green mosses, blue skies. But under scrutiny, there is a brooding undercurrent of tragedy and despair. Krantz’s use of brilliant colors belies the tragedy, giving off a sense of resolve and happiness. No sooner than thinking this is a resurrection, you start to notice physical defects, signs of abuse and poverty, or a contaminated, untouched room. The display is taken from the documentary published in book form in 2011 and features prominently a translated poem from a letter left at the site. This brings us to the first works you see when you walk into the facility, by sculptor David Helm. A professor of art at UNO, Helm just closed his most recent exhibit, If Leonardo were a Pioneerat MCC’s Gallery of Art and Design. Crowded into the center gallery, his 11 assemblages are constructed from a variety of materials, steel bar, wood constructions, and electronics. Similar to Gordin’s photos, each is focused around a human head, or group of heads. The similarities stop there, however. Helm uses a cast of the same male head, sometimes alone, other times in groups. The anonymous, bald heads, apparently of white plaster, are generic but have enough detail to identify as an older man. The eyes are vacant, and the effect is disturbing, looking a bit too much like Ray Milland in The Thing with Two Heads.Most of Helm’s pieces incorporate electronics in the form of lighting or sound. Also benefiting from sound is the piece called “Chord.” Three heads on top of a table, glowing warm yellow-orange, lit from below with bright fire-orange bulbs, and an eerily faint replaying of Tibetan monks performing their otherworldly throat singing. As with other works in this ambitious exhibit of the human condition, Helm’s 3D pieces are thought-provoking, sometimes humorous examinations of relationships, interactions, identity and personal space. For gallery hours and more information about programs and events associated with Human Condition,which closes May 4, call 402-341-3800 or go to Kaneko’s Facebook page or website, thekaneko.org.